We passed through Oklahoma City last year on our Route 66 trip. We were looking for a wall to paint a quick mural for an unrelated project and met Ryan Faught who gave us permission to paint on his building in Midtown. We learned that Ryan spent a lot of time traveling on his sailboat so we had an instant nomadic travel connection. Passing through OKC again this year en route to our next mural in Knoxville, TN, we decided to do a Greetings from OKC mural on the same building. 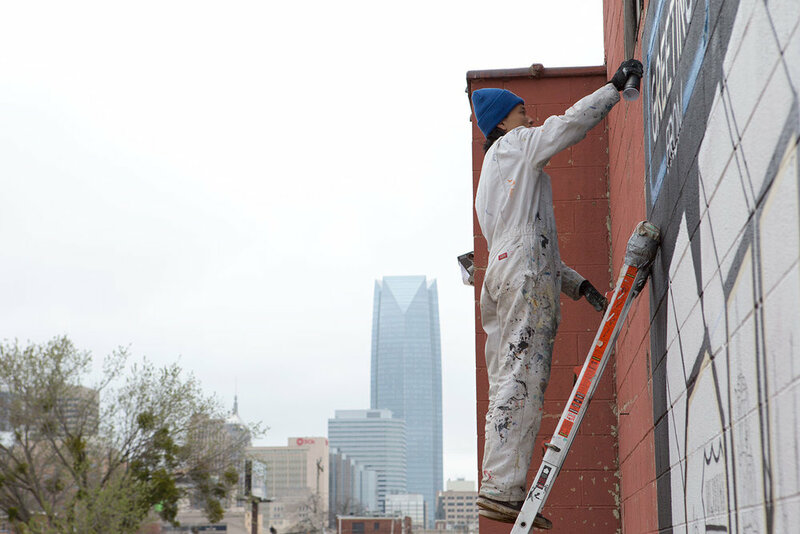 After a quick and easy approval from the Midtown Renaissance, we planned to do an abbreviated "OKC" large letter mural. On top of painting the mural in OKC, we finally got solar panels installed while in town! We're still wondering why it took us two years to get solar and highly recommended for anyone who does as much boondocking/dry camping as we do. We purchased two 100W Renogy panels and a 400W inverter for our setup mainly to keep our house batteries charged throughout the day. Thank you to the OKC Thunder for their support and making this one possible! Also thanks to Cayla from the Plaza District for sharing some of the ideas for content. Special thanks to Bombing Science for their support of our project and shipping spray paint caps (especially stencil caps) to test out along with along other goodies. While the stencil caps have been around for a while, Victor never really tried messing with them too much until Dcypher showed me the proper way to use them with gray dots in Los Angeles for the project with Airbnb. They really helped with some of the detail in the imagery without having to use brush Coming from a background of doing lettering and more graphic imagery, I'm still new to the photorealism techniques!